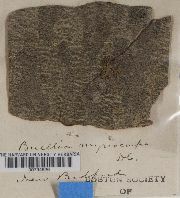 Thallus: crustose, rimose to rimose-areolate, thin, ±continuous; prothallus: absent surface: dark to pale gray rarely brown, pale brown, greenish brown, dull, epruinose, but frequently heavily impregnated by mineral dust, phenocorticate, esorediate medulla: white, lacking calcium oxalate (H2SO4-) Apothecia: lecideine; (0.2-)0.3-0.4(-0.5) mm in diam., soon sessile margin: black, thin, rarely persistent, soon excluded disc: black, epruinose, plane, soon becoming convex proper exciple: narrow, poorly differentiated, aethalea-type, inner excipular hyphae narrow, hyaline, prosoplectenchymatous (textura oblita), often reduced, similar in structure and orientation to the paraphyses, transient with the deep reddish brown hypothecium (leptoclinoides-brown, textura intricata), outer excipular hyphae parallel, moderately swollen (textura oblita) and usually strongly carbonized with various amounts of a brown pigment (cf. elachista-brown, HNO3-) epihymenium: brown, pigmentation continuous with the outer exciple (HNO3-) hymenium: hyaline, not inspersed with oil droplets; paraphyses: simple to moderately branched, apically swollen, with a brown pigment cap (cf. elachista-brown) asci: clavate, Bacidia-type, 8-spored ascospores: soon brown, 1-septate, ellipsoid, not constricted, with obtuse ends, not curved, (10.5-)11.3-[12.4]-13.7(-14) x (5-)5.6-[5.8]- 6.6(-7.5) µm (n=50); proper septum: narrow, not thickening during spore ontogeny (Buellia-type); ornamentation: faintly or distinctly microrugulate, or not visible in DIC Pycnidia: very rare, urceolate to globose, unilocular, at maturity lined with short barely branched conidiophores; ontogeny similar to the Roccella-type conidiogenous cells: terminal, not intercalary (conidiophore-type III) conidia: short-filiform, curved, 12-15(-18) x 0.5-1 µm (n=50) Spot tests: all negative (K-, P-, C-, KC-, CK-) fluorescence: UV- (dark) iodine reaction: medulla non-amyloid Secondary metabolites: none detected. Substrate and ecology: on bark or wood in dust-rich, often nutrient rich and disturbed habitats, extremely rarely on rock, one collection on decaying bryophytes, common at higher elevations World distribution: probably cosmopolitan and very common, especially in disturbed, nutrient enriched habitats Sonoran distribution: common throughout southern California and northern Baja California, occasionally also in Arizonan uplands, and Chihuahua. Notes: Buellia punctata s. str. is characterized by a "scurfy", rimose, gray thallus, its smooth to very faintly ornamented, thin-walled spores lacking septal thickenings and its relatively short, filiform conidia (mostly <15 µm, rarely up to 18 µm). Saxicolous species were often carelessly lumped into B. punctata s. l. (Bungartz et al. 2004b). The corticolous material is also heterogeneous. Many Sonoran specimens have brown rather than gray, smooth rather than roughened thalli. 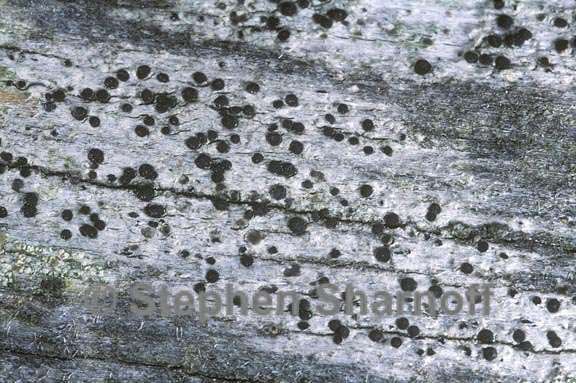 Their spores can be ornamented, not smooth, or characterized by a thick endospore, which could be mistaken for septal thickenings. To some extent these characters are correlated and further investigation is necessary. According to Sheard and May (1997), North American material has generally longer conidia [p. 166:"14-(19-22)-27 µm"] than the values reported for European specimens [Scheidegger (1993) p. 343: "up to 15 µm"]. Sheard and May (1997) also mention a distinct spore ornamentation that can usually be observed. They suggest that "corticolous material in North America may belong to more than one taxon" (Sheard and May 1997, p.166). Our preliminary studies show that even European corticolous material is not homogeneous. Nevertheless, it would currently not be advisable to describe new species. An extensive study will certainly uncover suitable names, which were previously ignored or carelessly reduced to synonymy. 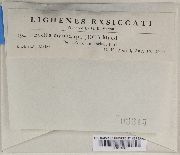 The identity of the type of B. punctata is currently not resolved. A lectotype, or possibly a neotype will have to be selected. Commonly, it is assumed that the species is very widely distributed and common. To assess if a narrow species concept, as outlined above, is warranted, a much wider range of material must be studied. 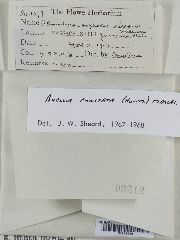 This will need to include both North American and European specimens as well as type material of taxa generally assumed to be synonymous with B. punctata. One possible segregate of B. punctata s. l. is B. extenuata Müll. Arg. Marbach (2000) reported two specimens of this taxon from the Sonoran Region. One specimen from Baja California Sur clearly belongs to B. fouquieriensis; the second specimen falls within the range of variation accepted here as B. punctata s. l. Marbach (2000) suggested that A. extenuata is widely distributed in tropical-subtropical regions - as widely distributed as B. punctata in cool-temperate regions. Distinguishing the two taxa purely by their geographical range is, however, problematic. 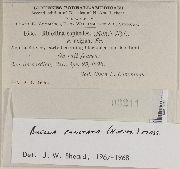 Marbach's description of A. extenuata does not provide any additional, significant differences. 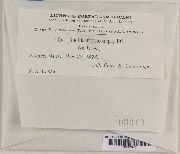 Several specimens annotated by Marbach as A. extenuata, all collected in Brazil (hb. Kalb), are not distinctly different from B. punctata s. l. Until type material of both taxa has critically been examined, it does not appear justified to distinguish the two taxa.